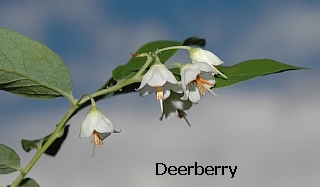 According to Wiegand & Eames (ref.1) there are seven species of Vaccinium growing in the Cayuga Lake Basin: V. stamineum (deer or huckleberry), V. corymbosum (high bush blueberry), V. angustifolium (low bush blueberry), V. pallidum (late upland blueberry), V. myrtilloides (velvet leafed blueberry), V. oxycoccus (small cranberry), and V. macrocarpon (large cranberry). I chose to write about Vaccinium because it is August and that is when I head out to local U-Picks to fill my freezer with the cultivated varieties of our native high bush blueberry. I had known that there were low bush blueberries and huckleberries growing locally, as I have seen them on hikes through the Lindsay Parsons biodiversity preserve and the Danby State Forest, but I was surprised to find out that cranberries grow in our area as well. The blueberries, with the exception of V. corymbosum, tend to grow in dry or gravelly soils in open woods, from acid to non calcarious soils to slightly calcarious soils. 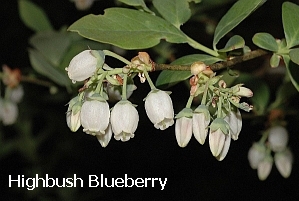 The high bush blueberry grows in or near acid or calcareous bogs, whereas the cranberries grow in acid bogs or boggy acid soils. Interestingly, the cultivated high bush blueberries are mostly found on our hill tops, seemingly the antithesis of ‘in or near bogs’. The fruits of all these plants are delicious to humans and the preferred foods of many species of birds, as well as raccoons, dogs, bears, fox, and coyotes. They also have a lovely fall color of scarlet red, and the bees certainly work hard pollinating them. They are worth planting in your landscape, and are pretty adaptable as long as they don’t have to go without moist soil. If you plant shrubs now, in just 3 to 5 years you should be able to get a sizable fruit crop, and in 10 to 20 years, you won’t have to pay for berries ever again! There are many U-Pick farms in the area, all in pretty locations, most with nice views. Blueberries are high in antioxidants but really, are just a wonderful taste of summer.